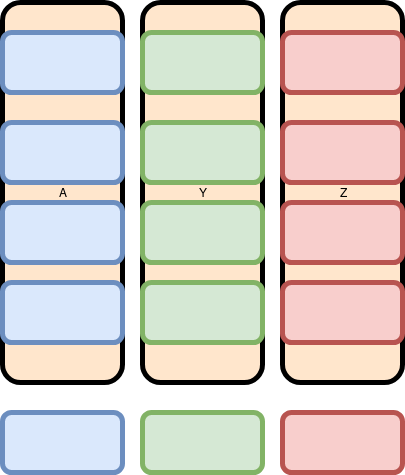 Since Data.frames are organized as a set of parallel vectors, adding a new row requires reallocation and copy. We tend to think of the data like this: Each row contains one entry each of a (A, Y, Z) represented by one of each color Blue, Green, and Red. 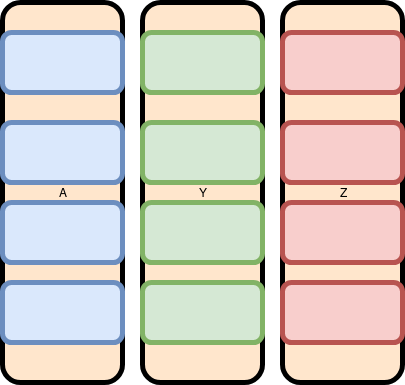 Because all the Data is laid out end to end, the Y and Z columns have to be moved. This is expensive. The fix is to avoid treating the data as a table until all of the data is generated. When working with individual vectors, we can append values to a single vector with moving the others. Even if you are only working with a local repository, Git makes it much easier to revert to a known working version. git commit -m "Message about the commit." git add *.R git commit -m "Message about the commit." Setup a unit test or two to confirm the function has not changed. In my case, the code calculates a value called bias_nowt. So long as I continue to product this number, my code behaves the same, and I can continue to restructure. Ideally, I would be checking this value in an automated manner, but this code is not yet in the vicinity of being an R package, and so setting up Unit tests would be more work than called for. It would not take much for me to change my mind on this, though. Make it possible to function inside your code. In the case of the code I am working with, lots of trial and error has lead to much, much commented out code. Removing it reduced the lines of code from 554 to around 300. It makes it easier to not get lost. With old code committed to git, you don’t need to leave it inside the working code. You are going to want to call your code from somewhere else. Take everything that is “top level” and put it into a function. Run the unit tests. Commit to Git. When I run the code now, I see the times spend in various functions. Because these are all scalar values, the data.frame is a single row. My goal is to replace these with vectors, and call data.frame one with the completed vector. I added Vectors to the code and insert data into them Parallel to theData.Frame. My naming convention was to create a new variable that matched the original, but with an underbar after it. A Scalar named A would be paired with a Vector named A_. This is a good time to run the unit tests. Nothing should change. Confirm that with the test. If the run successfully, check the changes in to git. It is an interim change, but one that you might want to roll back to if you mess up the next step. Run the unit tests. If the run successfully, check the changes in to git. After each of these, rerun the unit tests. You might be tempted to make more changes than this at once and skip running the tests (they take close to 90 seconds at this point) but don’t. You will save more time in the long run triggering your errors right as you make them. Run the unit tests. Commit. You will also want to remove the other call to data.frame and the call to rbind. A reduction From 75 seconds to 29.4. Cut the time to execute more than in half. I’m sure we can make additional performance improvements, but we won’t be clipping 35 seconds off the time again. This entry was posted in R-Lang, Software by Adam Young. Bookmark the permalink.